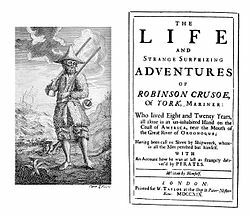 Robinson Crusoe /ˌrɒbɪnsən ˈkruːsoʊ/ is a novelle bi Daniel Defoe, first published on 25 Aprile 1719. ↑ "The Primitive Crusoe, 1719–1780". Picturing the First Castaway: the Illustrations of Robinson Crusoe - Paul Wilson and Michael Eck. Retrieved 25 June 2012. This page wis last eeditit on 11 Apryle 2017, at 17:52.